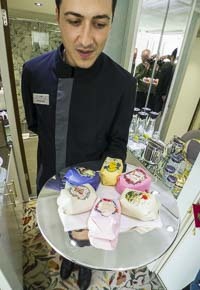 ABOVE: Csaba, our steward in suite 409, presents an array of luxury bath soaps by Claus Porto. INSET BELOW: A suite floor plan, a suite bathroom, a stateroom floor plan, and a Category 1 cabin. River Countess accommodates 132 passengers in 62 staterooms and four suites. Suites are located on the main deck (Marco Polo Deck). Each suite has 214 sq. ft. (20 sq. meters) of floor space, including a foyer and makeup area next to a large bathroom with double sinks. We were in suite 409, and while the room was considerably smaller than a typical oceangoing ship's staterooms, it compared favorably to suites on other river vessels. As suite occupants, we were treated to Claus Porto soaps, a Nespresso machine, a fruit basket, a supply of drinks (including decanters of spirits), complimentary laundry service, help with unpacking, in-room breakfasts, and complimentary in-suite massages. Being simple folk, we declined most of the perks but enjoyed the spacious layout, the seating area, and--most of all--the huge walk-in shower, which had plenty of space for drip-drying clothes. Staterooms come in five categories, with all cabins having 151 sq. ft. (14 sq. meters) of floor area. The main differences between categories are location and windows: Staterooms and suites on Marco Polo Deck have French balconies, category 2 and 3 staterooms on Bellini Deck have large picture windows, and category 4 and 5 cabins on Casanova and Tintoretto Decks have smaller windows. Uniworld also provides bottled water for all suite and stateroom occupants, but with a twist: Instead of using disposable plastic bottles, Uniworld offers metal bottles that can be hung on a belt or backpack with a carabiner and refilled from public fountains when they run dry. This is especially convenient during hot weather in Venice, since many of the city's squares have spigots with with cold, tasty water from the nearby mountains. Finally, if you're picky about pillows, Uniworld has you covered with a pillow menu that offers five different choices, from a "down feather-soft pillow" to a "lumbar supporting cushion." Floor plans and bottom inset photo courtesy of Uniworld Boutique River Cruise Collection.